Fabric Gallery and Interiors is easy to find, located in the beautiful village of Dunnington, on the edge of York. 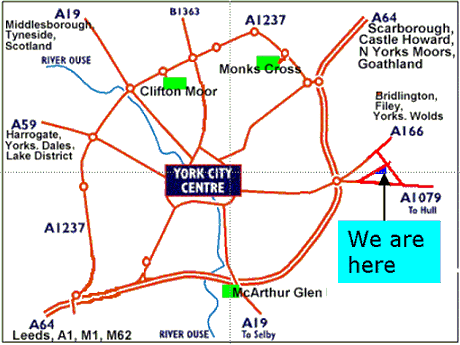 We’re just 5 minutes from the York A64 Eastern bypass. We have FREE PARKING in front of our shop. You can click on the map below for detailed map information. We’re only a short trip from, York City centre, Pocklington, Tadcaster, Market Weighton, Monks Cross, Clifton Moor, Vangarde Shopping Park, York Designer Outlet, Malton, Elvington, Wheldrake, Haxby, Copmanthorpe, Strensall and Stamford Bridge. Additionally, Leeds, Bridlington, Hull, Beverley, Howden, Easingwold, Driffield, Goole, Selby are all within 45 minutes of us. We are virtually in the centre of Yorkshire. Customers frequently travel to us from as far away as Middlesbrough, Whitby, Durham, Hartlepool, Darlington, Pontefract, Huddersfield, Lincoln, Barnsley, Sheffield, Doncaster, Hull, Wakefield, Bradford and Grimsby! Come along to our shop and find out why. You can use the map above to plan your trip to Fabric Gallery and Interiors. Just click on the map above for a fully interactive map and route planner. If you are programming your SatNav just enter our postcode “YO19 5PN”. If you are travelling some distance, why not combine a leisurely visit to Fabric Gallery & Interiors with a few hours sight-seeing in the historic City of York. You can even leave your car outside our shop and catch a bus right into the heart of York; you’ll avoid the traffic, the devious one-way system and parking charges. However if you cannot get to our shop or lack suitable transport, we can deliver finished made to measure curtains and blinds, fabric, poles, paint & accessories direct to your home or office. To save time we can deliver fabrics directly to your curtain maker or upholsterer. Please just ask.